Inflatable tents are one of the almost unknown camping necessities you don’t own yet. Inflatable tents are incredibly well made and can be very durable and strong, much like regular tents which use poles. Many inflatable tents are much lighter than regular tents and can be stored and transported very easily, even if you have a stored a sleeping bag in your pack. The tents also inflate very quickly, making setup a breeze, especially helpful if you’re in adverse weather conditions. Below, we’ve listed our favorite inflatable tents, from camping tents to forts for the kids, and even a transparent tent that would be amazing for a night out in the country, under the stars. Our favourite inflatable tent is the Moose Outdoors 6 Man Inflatable Tent. It is a brilliant all-round tent and can definitely take the place of a heavier, pole in-tent. Take it with you on any adventure and you and your family will never know you have even left home. 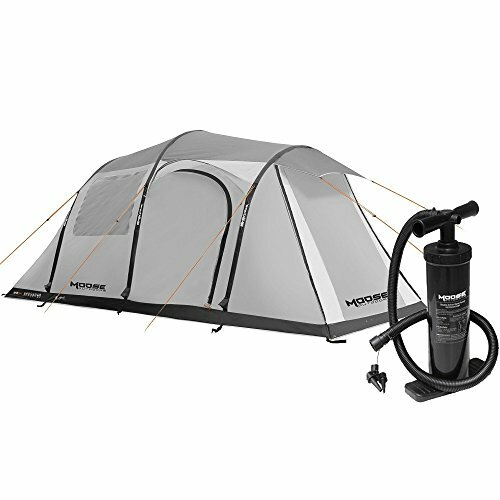 The best inflatable tent for camping goes to the Moose Outdoors 6 Person Inflatable Tent. It is very well made, incredibly easy to set up, and still light enough to travel with. Stay cool on warm days, and warm and dry when the weather takes a turn. Brilliant all round inflatable tent. The best backpacking inflatable goes to the Heimplanet The Cave. It is very sturdy, simple and quick to set up, and can fit on your back for easy transport. The shape of the tent ensures it can withstand harsh winds, and rain, and is the perfect travel companion for hikes or expeditions. 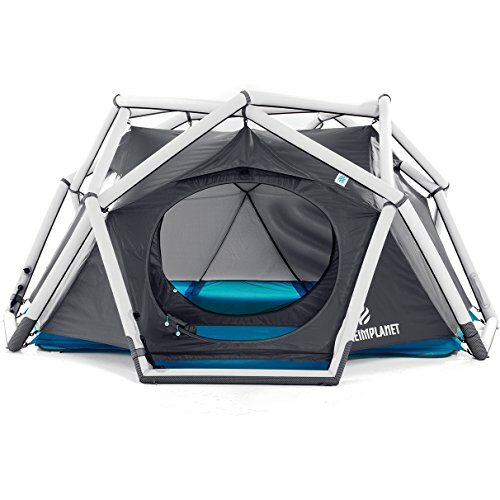 The Original Airfort is a brilliant little inflatable tent for the kids. Easy to set up and can offer hours of fun. The tent can be used for various occasions and will work well at a party as well out on a camping trip. Once again, theHeimplanet The Cave takes the spot as our favourite small tent. Easy to store and transport, and can fit into most hiking packs. The Olpro Martley Breeze takes the spot of our favorite large inflatable. Being able to hold 8 people, this is great for multiple families going on camping trips. The tent has enormous floor space and can basically be a home away from home for a family while out in the country. 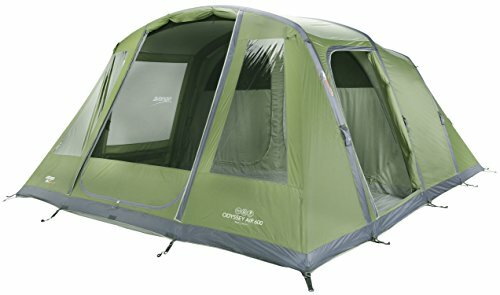 The Vango 6 Person Odyssey Air Tent is a great, family camping style inflatable tent. It can hold 6 people very comfortably, and the inflatable beams create extra space within the tent, while still keeping the tent strong and rigid. The tent has a linked in groundsheet that is very easy to clean and can be attached and detached from the living area in case it needs to be properly cleaned. The flysheet is made from highly durable polyester and is highly waterproof. The Original Airfort is most definitely a hit with the kids. 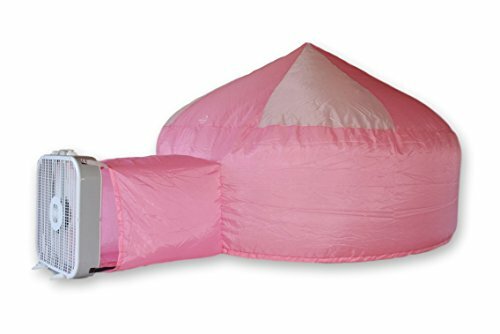 This dome style inflatable can be used on a camping trip, at a kids party, or just out in the garden. Using an ordinary household fan, the fort blows up in seconds. The fort is made of lightweight polyester, making it very durable but breathable. The fort comes with its own carry bag for simple storage and transport. The mesh divider also prevents any curious kids from getting too close to the fan. 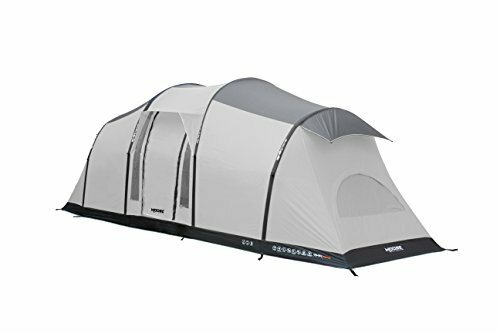 The Vango Odyssey Air 800, much like the Air 600, is an incredibly well made and strong inflatable beam tent. The flysheet is made from 700 denier polyester, making it very strong and durable, fire retardant and waterproof. The patented Vango tension band system provides extra stability. The large living space allows parents and kids to have separate sleeping quarters, and the tent is full standing height throughout, no need to bend down constantly just to fit. 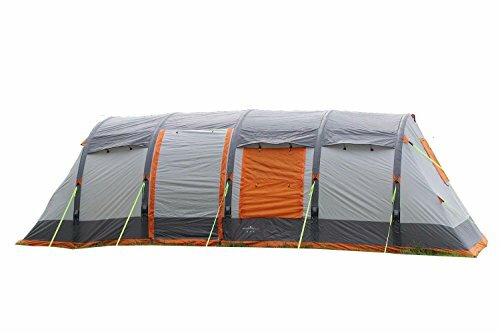 The Moose Outdoors 6 Person Inflatable tent is a brilliantly made, and highly durable inflatable with a large floor space while still staying lightweight and easy to store and travel with. 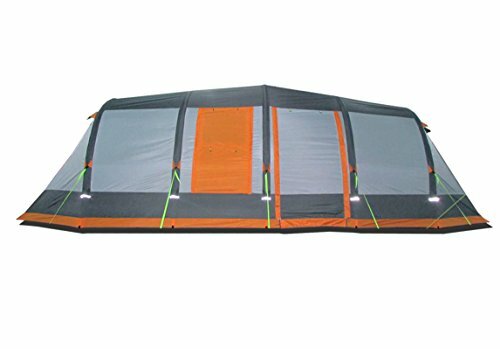 The high stability tent has quick inflate molding, waterproof, and is able to withstand very strong winds and rain. The tent is also flame resistant and UV protected, making it able to withstand most weather conditions and climates. The Olpro Martley Breeze Inflatable tent is one of the biggest tents on our list. The tent is incredibly roomy, as there is a bedroom area, a separate living area, and when the weather is good, there are two poles you can use to erect the door and make a delightful canopy. The inflatable beams makes pitching this tent incredibly quick and easy, while the tent itself is waterproof and will keep you warm and dry if the weather takes a turn for the worst. The air pump that is included also means this all in one package is ready to go at any time. The Olpro Wichenford Breeze is another large tent from the folks over at Olpro. Much like the Breeze we reviewed above, the Wichenford is made of the same quality materials and work. The large bedroom and living areas makes this tent ideal for families or a group of friends. The tent is made from waterproof, and very strong polyester, keeping you dry when it starts to rain, and the sewn in groundsheet will keep you dry and warm on those cold days and nights. The tent is also very easy and quick to inflate, no need to fuss with poles. 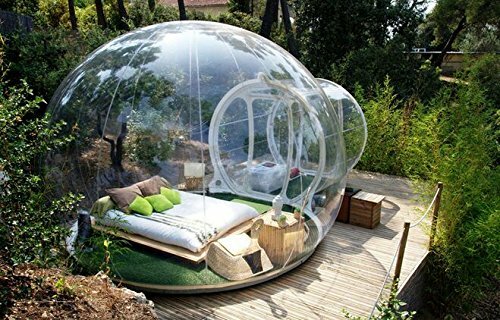 This transparent bubble tent is one of the more unique inflatables on our list. Being completely transparent gives you the ability to have a 360-degree range of view, which can make camping out in the country even more beautiful, never miss another view again. The tent is incredibly versatile and can be used for camping, outdoor parties, at the beach, or just somewhere to relax. Being 4 meters wide, you can easily fit a mattress and your belongings inside for a cozy camping experience. The Moose Outdoors Inflatable Family tent is made with Qwik Frame technology, making it incredibly easy to inflate and setup. The tent is also incredibly lightweight due to the lack of metal, making it easy to carry and transport. The sewn in groundsheet keeps you protected from the elements and keeps you warm and dry on cold wet days. The tent is also water, UV, and fire resistant, ensuring it can withstand any weather conditions and most climates. The Heimplanet The Cave Inflatable Tent is a very easy tent to inflate as the frame, inner tent and outer tent inflate all at once in less than a minute, making this the ideal tent for backpacking or hiking, and can be inflated at any time with any standard pump. The geodesic structure gives the tent stability and the ability to withstand strong winds and is a shape preferred for expeditions. The multi-chamber feature also means that the tent will stay inflated even if one section deflates, making sure it won’t collapse on you when you least expect it. In conclusion, an inflatable tent is great for people who are looking for a more convenient tent option. All the tents on our list are versatile, strong and can be inflated in only a few minutes, as well as being very easy to store and transport. The lack of poles and small pieces also mean you won’t be left without a tent if you forget an essential part. You may need to purchase a pump for inflation, but that is a small price for the convenience, strength, and stability that comes with one of these inflatables.